In 2014, fishing continued to be a delight. Unlike prior years, I fished in saltwater over five times. On my birthday, I fished beneath Montauk Lighthouse in a swim suit and flip-flops. Of course the warm water likely kept the striped bass away. 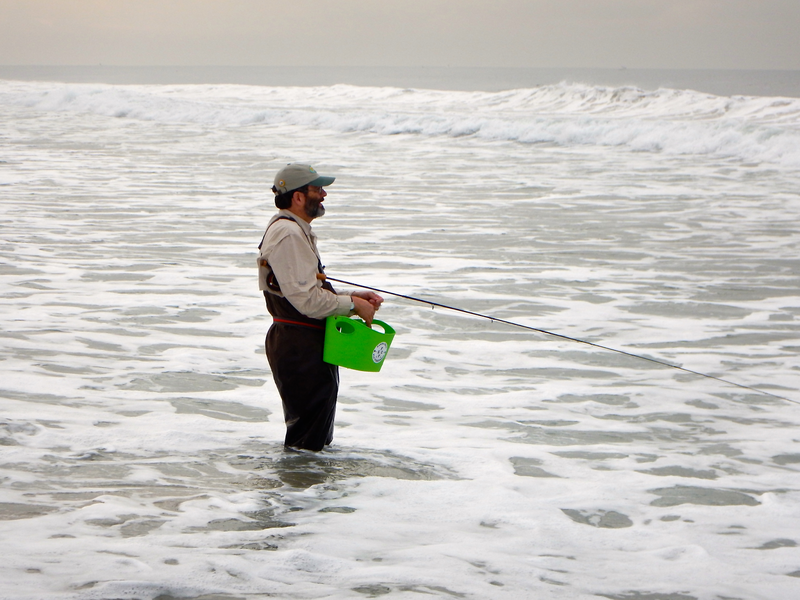 Later in November, I fished in the Pacific Ocean; my friend Carl organized a saltwater fly fishing trip to a beach just west of LAX. It was a great but fishless day and the practice may land a fish in the future. Dorothy, Lily, Dennis, Seymour and I had great bonding moments during my ill-conceived project to reverse the orientation of a salt water fly fishing reel. In my haste to switch the line from a right-handed to left-handed set-up, I tangled the fly line, running line and backing. Almost everything but a stubborn knot of backing got untangled. Seymour led a valiant effort to fix the reel drag; when I fix a small detail, everything will be wonderful for the upcoming fishing season! This past 2014, many favorite experiences were food-related. Dr. Freud probably would have had something to say about that, but, to paraphrase what he said about cigars, sometimes a good meal is just a good meal. 1. Pizza: My favorite meal continues to be good pizza - - or ok pizza with family and friends. Readers felt the same way, too; a post on New York City pizza got the most hits of all the 2014 blog posts. 2014 started with Steve and me sharing a deep-dish pizza at Ralph’s Tavern in Colonie, New York. Later in the year, it was back to Tom Cavallo’s in New Hartford, New York for sausage and pepper pizza. If you are in the Rochester area, Mark’s Pizza, which is cheesy with a thicker crust and good sauce, is worth a stop. Mark’s has expanded east and now has a restaurant in Auburn, New York in the Finger Lakes region. On Long Island, Prima Stella, in Manorville (631-281-0003) continues to delight with its crispy, thin crust pizza and excellent service. Branchinelli’s (631-474-1200), a pizzeria from Port Jefferson, opened a branch in Miller Place and offers a delicious thin-crust pizza. 2. The Cheesecake Factory: Yes, it’s a chain - - but it’s a chain with class. The menu includes large, fresh salads with unusual - - but delightful - - flavor combinations. The staff is attentive, capable and welcoming without being a pest. Restaurant décor suggests a movie set from Hollywood’s golden days; that suggests a warmer place than the Capital Region has been this week. 3. The Barnsider Restaurant: This steakhouse has been going strong in suburban Albany for almost 40 years. In addition to beef cooked exactly right, the restaurant offers a salad bar loaded with selections, great seafood and an incomparable martini. 4. The Gateway Diner: Barry Levinson didn’t realize it, but when he decided to make his movie Diner he was thinking about the Gateway. While the place is no longer open 24/7, it still has an appealing busyness and offers an epic variety of food. Our family gives high marks to the Reuben, the large salads and the generous servings of rice pudding. 5. The Lost Dog: This restaurant in Binghamton, New York has an eclectic menu and great service. If you are lucky, they will be playing opera arias while you dine. 6. The Grateful Dawg: In Scotia, New York is a comfortable storefront restaurant with a Grateful Dead motif. The main item on the Dawg’s menu is a quartet of small hotdogs with meat sauce and onions but they also have cheese steak sliders and pulled pork sandwiches. The onion rings are also delightful. 7. Guilderland Community Garden: All the gardening and nearly all the vegetables described in the blog this year happened at the Guilderland Community Garden. In addition to providing great vegetables in season, the Garden delighted this year with a late harvest. After the snow, a late holiday trip to the Garden yielded nearly two dozen carrots, some Swiss chard and broccoli. 8. Pitchfork: This year’s birthday gifts included a pitchfork. Along with a torch, a pitchfork is useful for angry villagers in a Frankenstein movie. But more importantly, it is exactly the right tool for turning over and stirring up a compost pile! 9. Brown Trout Samoyed Calendar: Rose the Dog was a Samoyed who graced our lives for nearly 15 years. 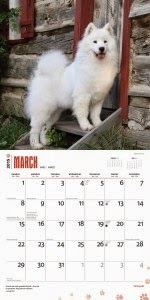 During this time, Brown Trout Publishers included a Samoyed calendar in their offerings. Sadly, Rose died but Brown Trout has continued to publish the calendar. It reminds us of all the wonderful times we had with the greatest dog who ever lived. 10. Family and Friends: Thanks to all my family and friends for all the great times in 2014. The places and events chronicled in this blog are possibly mostly because of you!